Heat oil in a large pot and sauté onion, celery, garlic, parsley and carrots, until limp. Add tomato paste and cabbage. Stir to combine. Add stock powder, water, sugar, rice, pasta, beans and lentils. Stir well and bring to the boil. Reduce heat, cover and simmer for 45 minutes. Season with salt and pepper. Great served with a sprinkle of fresh parmesan cheese! 362 members have added this recipe to their cookbook. I make Minestrone soup all the time. Planning to make it this weekend. I would add a little bacon. I would omit the sugar and rice. Reduce the pasta to 1/2 a cup. Per Fatsecret, the Olive Garden Minestrone soup has 164 calories and 18g of Carbs. It would be much better to go and get the Olive Garden soup than to make this one! Please when you have soups and stews, etc, advise how MUCH a serving is, ex. 1 cup, 2 cups, etc. How would I know how much a serving is with a huge pot of soup????? This was just ok. It made tons so I froze a large portion and if we don't eat more (for 3rd day in a row), I will freeze that portion also. After deciding to make it, I realized that it was high in carbs, so I really had to adjust my diet to compensate for that. I only had one bowl. Also, the taste was a bit bland. I kept trying to figure out what seasoning it was missing to make it taste more like olive garden or Carino's. I am not an italian food cook, so I am not very familiar with the seasonings that are used in italian cooking. Type O's need to avoid wheat pasta, kidney beans and lentils. A quick and very filling soup that doubles as a meal. A yummy soup that is hearty and filling. Easy soup that tastes good and freezes well. 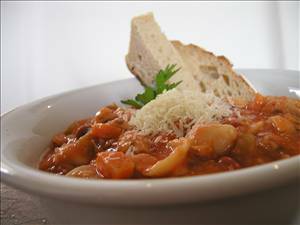 There are 219 calories in 1 serving of Minestrone Soup. Calorie break-down: 9% fat, 71% carbs, 20% protein.